A bid to dramatically expand Temecula's boundary by adding a 7-square-mile swath to its south side may proceed without any organized opposition. That course was set when the City Council recently voted to submit a new application to a Riverside County boundary-setting agency. The same day, a key player in a years-long land use controversy announced it will not oppose the 4,500-acre annexation this time around. If the Santa Margarita annexation proceeds as expected, it would be an anticlimactic finish to a proposal that has cost both sides more than $650,000 and sparked one of the longest Local Agency Formation Commission hearings in recent memory. And if all goes as expected, the granite-strewn area that stretches from the existing city limits to the San Diego County border west of Interstate 15 could become part of Temecula by the end of this year. "It's possible," Patrick Richardson, Temecula's planning and redevelopment director, said after the council's Jan. 12 action. That would boost Temecula's size to about 35 square miles. The 20-year-old city's population jumped and it grew to 28 square miles years ago when the Redhawk, Vail Ranch and Roripaugh Ranch annexations were completed. The proposed Santa Margarita annexation has been debated for years. At the heart of the area is a 155-acre site where a construction and mining company hopes to extract 270 million tons of sand, gravel and other materials over a 75-year period. 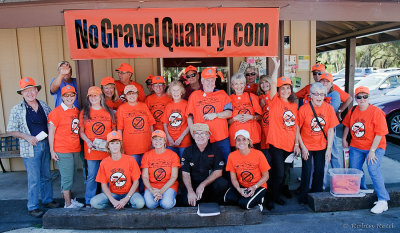 The proposed Liberty Quarry has drawn widespread opposition from environmentalists and development-wary residents. They backed the city's efforts to annex land the quarry site, which anchors a rock-strewn bluff behind a California Highway Patrol truck inspection and weigh station near the San Diego County community of Rainbow. Mine foes say Liberty Quarry would also increase air pollution, boost area truck traffic, mar scenic views and also deplete scarce regional water supplies. Granite officials and other mine supporters cite a growing need for construction materials and a desire to reduce the miles that sand and gravel must currently be shipped to reach local construction and road building sites. They also point to the jobs and future tax revenues that Liberty Quarry would bring to the area. The original annexation application - which included the quarry site - was denied by LAFCO June 4. That hearing lasted nearly 10 hours and drew comments from more than Advertisement100 speakers. Granite Construction Co., which hopes to open Liberty Quarry, opposed that annexation request because it would have placed oversight of the quarry land use plan in the city's hands rather than the county. The company currently operates mines in Indio and the Pala area. Granite officials feared such a step because the city planned to put a zoning change in place that would have prevented mining from occurring in the annexation area for several years. Temecula spent more than $365,000 over a period of several years on annexation-related studies, reports, application fees and other costs, city records show. Faced with the prospect of having its mine site rezoned, Granite officials said they felt compelled to spend more than $300,000 to counter the city's annexation plan. The June LAFCO decision meant that county officials will continue to review the mine development plan. The current timetable calls for the first hearings on the quarry plan to occur this summer. Those hearings would be held by the county Planning Commission. That panel would make approval or denial recommendations to the county Board of Supervisors. The recent council action means the proposed annexation will proceed on a separate review track that unfolds about the same time as the quarry review. City officials were buoyed by a statement released by Granite that it would support Temecula's revised annexation plan. "That's great," Richardson said when he learned of the statement. The statement released by a Granite spokesperson said: "Liberty Quarry would like to support the city's annexation request, and we look forward to reviewing the city's report to learn more about their plans. We hope that they will consider taking advantage of the Santa Margarita Ecological Reserve's vast potential and look to San Diego County's Mission Trails Regional Park as a great example of a successful outdoor attraction." Keep in mind that the words, "Liberty quarry would LIKE to support the city's annexation request" does NOT mean they WILL; just another of Granite's "trick words." Gary Johnson said at the annexation hearing in June, "We would like to support the city's annexation plan, but, we can't." The combined actions - the council vote and Granite's statement - also pleased a leader of a grassroots group that has opposed the quarry and backed the annexation plan. I am quite sure that Granite's statement "pleased" no one that I am aware of. "I'd say it (the annexation) is a done deal," said Kathleen Hamilton, a leader of the Save Our Southwest Hills community group. Barring any unexpected delays, LAFCO commissioners could review the annexation proposal in July or August, George Spiliotis, the agency's chief executive, said in a Tuesday telephone interview. If approved then, the annexation could take effect two to three months later after some administrative steps are completed, he said. Temecula expects to spend another $34,000 in fees, staff and legal fees and other costs to complete the annexation process, according to a city report. Yams - Combine yams and milk in a 2-quart glass measure or bowl: cover with vented plastic wrap. Microwave on high 10 minutes; let stand 5 minutes. Add sugar, butter and ¼ tsp. each of the salt & pepper; mash until smooth. Keep warm. Meanwhile, heat a double stovetop grill pan over medium heat. Adjust oven rack 6” from broiler source; heat broiler. In a 2-cup glass measure, whisk juice concentrate, mustard, onion, cumin, and spice; microwave on high 3 minutes or until glaze boils and begins to thicken. Arrange apple slices on broiler pan rack; bruch apples with glaze. Broil 3 minutes, turn slices, then brush with more glaze. Broil second side 3 minutes or until lightly browned and tender. Meanwhile, season pork chops on both sides with remaining salt & pepper and lightly coat with cooking spray. Grill pork chops 7 minutes; turning once and brushing with remaining glaze, until just barely pink in thickest part when cut with a knife. 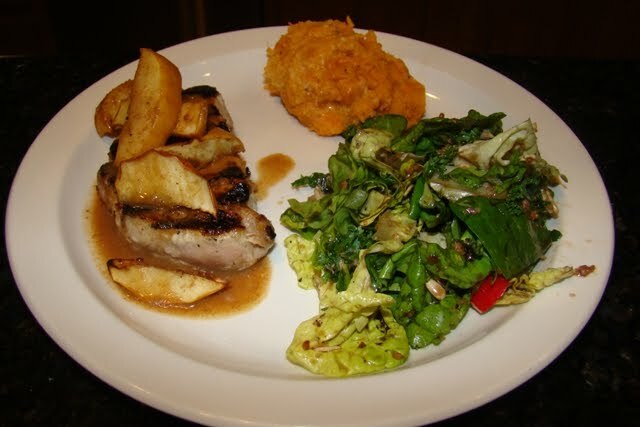 Serve with apple slizes and mashed yams. to lend a Loving & Helping hand to those in need. This training is for anyone who wants to learn to be a more effective voice regarding the environmental impacts of projects. Led by a panel of scientific and legal experts, provides an introduction to CEQA (the CA Environmental Quality Act) and related regional environmental laws, including the Endangered Species Act. Includes practical guidance on how to effectively comment on EIRs, and provides valuable resources for local projects near your neigborhood. No experience required, all are welcome! Workshop fee is $12 for members, $15 non-members, lunch is included. 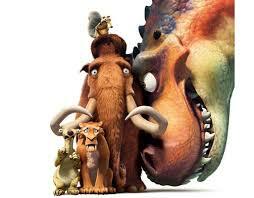 Goal of Friday Family Fun Film night: Pure Fun. Have the kids laugh together in a church event. San Diego Animal Control says animals in this area go to the Carlsbad shelter, but there are others. Our cat was found at the Humane Society on Valley Center Drive. Also, the information that they had on him was wrong. They listed him as a 2 year old found in San Marcos. He’s 6. We think that he might have hopped in a car (that’s the only way he could have gotten that far), so check all the shelters! Go there in person. They told us over the phone that they didn’t have a cat matching his description, and even when we got to the shelter, they said he wasn’t there. We made them go through every cage, and we found him. Don’t give up! We thought he’d gotten out and been eaten by a coyote. But here is a strange incredible story and he was there for 3 weeks. We called and called the Animal Control shelter, and found the Humane Society by luck and went there on a slim hope that maybe he was really there. Don’t give up, and check all the shelters by going there. Hopefully this will never happen to you, but if it does, remember this miracle and hopefully your lost animal will be safe as well! I made this delicious "semi-organic" salad from fresh greens I bought from our Rainbow neighbor Cora (See post "The Gardener"). This is the first year George and Cora are experimenting with their organic garden. I bought arugula, romaine, kale, cilantro, flat leaf parsley, broccolini leaves and heirloom tomatoes (not in salad). 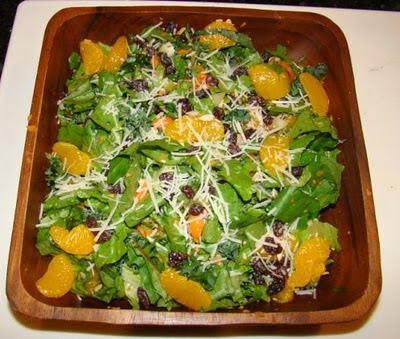 I say "semi-organic" because I did use other ingredients including canned mandarins, raisins, salt-free sunflower seeds, sprinkle of shredded parmesan and homemade "lemon/orange/balsamic vinagrette dressing. It was delicious with a brined and baked pork roast and sweet mashed potatoes. It made a huge salad (this shows only half) so the next night, I cut up the leftover pork roast into cubes, seared them to warm up and tossed over the same salad with dressing to make a "meal salad". Healthy, filling, delicious...and helping neighbors.